In the 1960's colorful, geometric designs were popular with decor, clothes, and other aesthetic things. This Pampilles Multi - Window Peel N Stick makes a cool dorm room decorating idea for those who want to bring a vintage vibe to the dorm room. 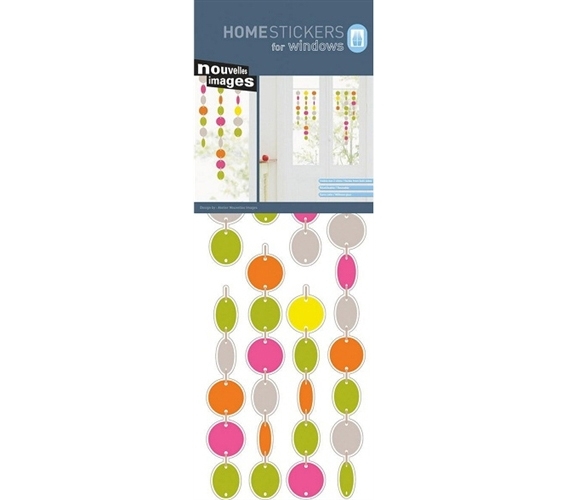 Green, pink, orange, yellow, and silver circles "dangle" on this Pampilles Multi - Window Peel N Stick and look about as "mod" as it gets. Adding such an array of color to your dorm room will make your college dorm more energetic and fun. Decorating your dorm room is fun with Peel N' Stick style dorm decorations. You could never put regular stickers on your dorm room windows, but you can use this Pampilles Multi - Window Peel N Stick because it's 100% removable, re-positionable, and residue-free. It's fun to play with the colors and shapes by arranging them in different ways, unique to your own preference. With Peel N' Stick, your dorm room will be a blast to deck out!